Language is at the heart of everything we do, and without good English-language skills students cannot succeed in school. As an English teacher, you will not only teach this important foundational communications skill, you’ll engage students in a variety of literary genres including classic texts, creative writing, poetry, web-based media, and more. The diversity of methods English teachers are able to use makes this profession especially enjoyable and fulfilling. 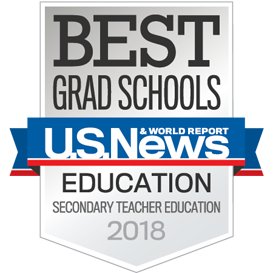 At the Curry School of Education and Human Development, you have the opportunity to learn from renowned faculty at one of the best graduate schools in the country. We offer several avenues for you to either teach English or create the best course materials and curriculum to reach students. Students earning a PGMT degree who intend to become middle or high school English teachers can expect to have several job opportunities. Our Curriculum & Instruction graduates also have several options. They have become instructional coordinators or curriculum specialists, gone into government to improve educational policy, pursued careers in academia and research, and joined museums. A Ph.D. will prepare you for a career as a college or university professor or as a researcher in research organizations. The Curry School offers a Master of Teaching—English degree with licensure and endorsement in English. NEW PROGRAM CHANGE - The Curry Teacher Education program is pleased to announce the conversion of its secondary education program to a one-year Post-Graduate Master of Teaching (PGMT) starting May 2018. The one-year program will offer an intensive, field-based curriculum centered on high-leverage teaching practices. This program will replace the current B/MT and two-year PGMT models. Curry’s Education Specialist (Ed.S.) degree program is a terminal graduate program designed for the professional educator. Its 30-hour (minimum) requirements can be completed either full- or part-time with a chosen emphasis on English Education. Earning an Ed.D. in Curriculum & Instruction prepares you for employment as a curriculum specialist, faculty member or educational consultant to develop policies related to curriculum and the education of professionals. You would enroll in the version of this three-year, full-time degree that places an emphasis on English Education. Ed.D. students can may also complete this degree as a part-time student. Curry’s four-year, full-time Ph.D. in Education—English Education degree will prepare graduates for college or university positions in teacher education or for positions within research organizations.